I am a Reiki Master, Pastoral Counselor, and Ordained Interfaith Minister. 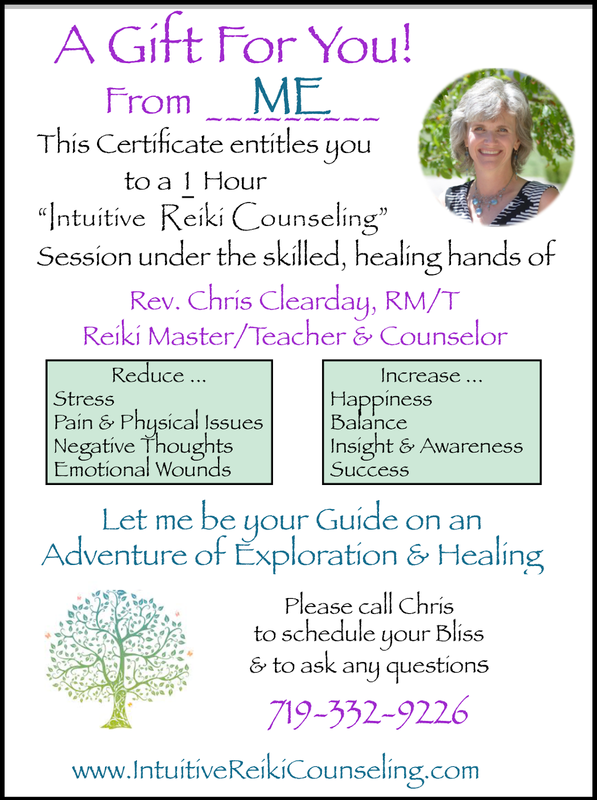 that combines intuitive counseling and intuitive Reiki energy healing therapy. called the Clearday Healing Methadology, which I developed over 20 years ago. This work is designed to make the biggest difference for you in the least amount of time. I am looking forward to partnering with you to achieve your goals. These goals are realistic and attainable. I demonstrate Specific Measurable Results. to schedule the one-hour appointment that is my gift to you. which is in the Mock Realty Building. The entrance is on Broadway, come up the steps. 825 S. Broadway St., Suite 200, Boulder, CO 80305. I have officially changed my business name to "Intuitive Reiki Counseling, LLC"
and I am changing my last name to Clearday, so there are lots of changes, all good! GIFT CERTIFICATES ARE ALSO AVAILABLE FOR YOUR LOVED ONES.